A favourite of local foodies and visitors alike could be set to take it’s last orders in The Western Isles. With delicacies like confit of Gressingham duck on fresh salad topped with homemade orange sauce in a ciabatta bun, or a scallop and chorizo roll with fresh lemon juice, it is no ordinary snack bar. But the popular gourmet mobile eatery in Stornoway could be packing up because it is mounted on a trailer. Now more than 650 regulars have signed an online petition and hundreds more have put pen to paper on a petition at the trailer itself. 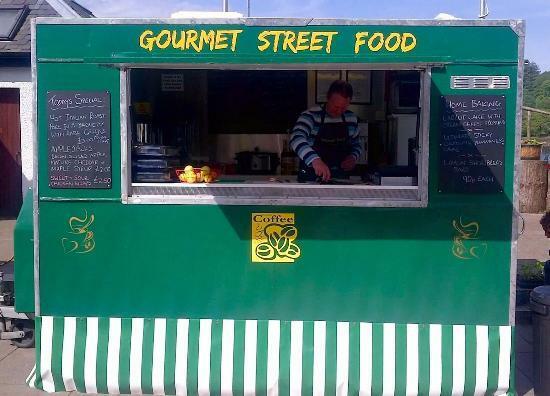 The Gourmet Street Food van regularly based in Perceval Square has been warned they could be evicted from the council land. The Western Isles Council is proposing a big rise in charges, limits on the size of stalls and a ban on wheeled vehicles except for gaining access to the square. Gourmet Street Food is run by Kelly and Paul Widdop who moved with their four children from Yorkshire to Breasclete on Lewis six years ago. Mr Widdop said: “We are really upset about this as they only gave us permission in the beginning because we were offering something unique and different. The Lewis and Harris Horticultural Producers Association has pointed out that it has had a small wheeled trailer in the square for many years without complaint. The council said no decision has yet been made yet but it is considering changes. A spokesman said: “The council has not told the Gourmet Street Food operation that they should vacate Perceval Square The council’s current policy on use of Perceval Square is that vehicles are only permitted within the area to set up and dismantle.